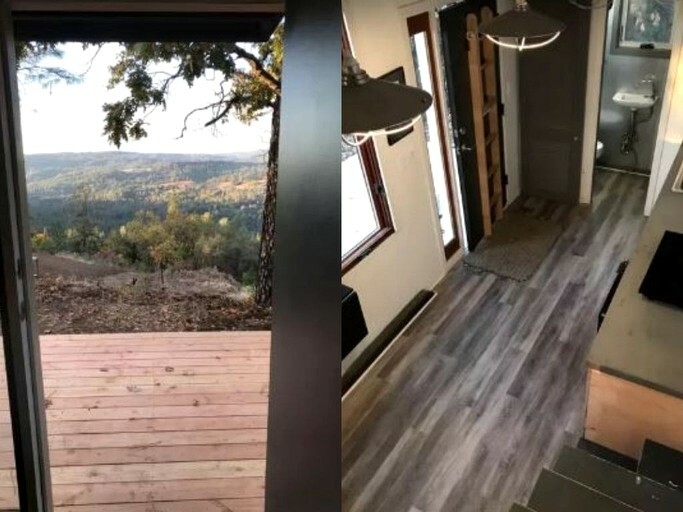 This pet-friendly tiny house is located near Folsom Lake in Somerset, California, and it can accommodate three guests with two beds and one bathroom. Stairs lead to the double bed in a loft above the living area. 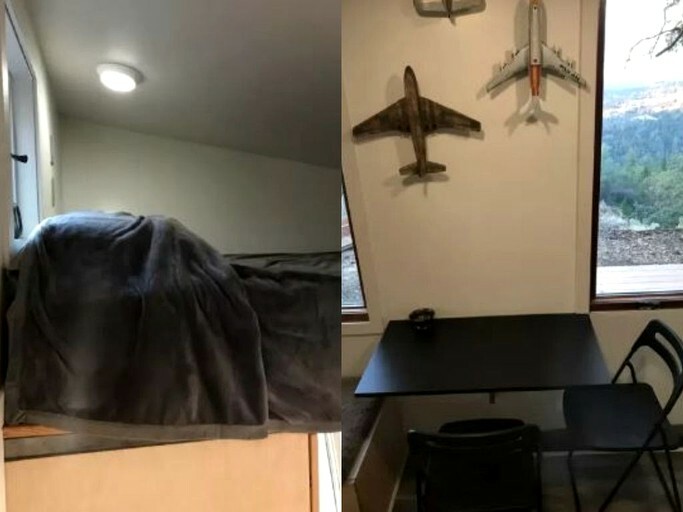 A twin bed, accessible via a ladder, is above the bathroom. 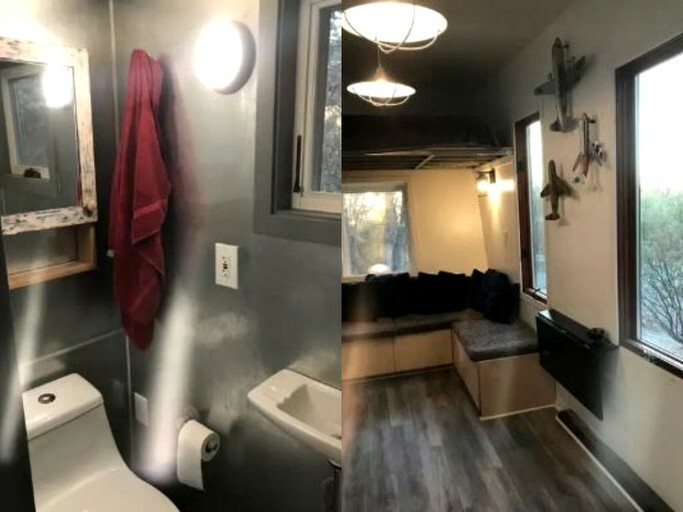 The bathroom has a toilet, a sink, and a shower. Linens and towels are provided. 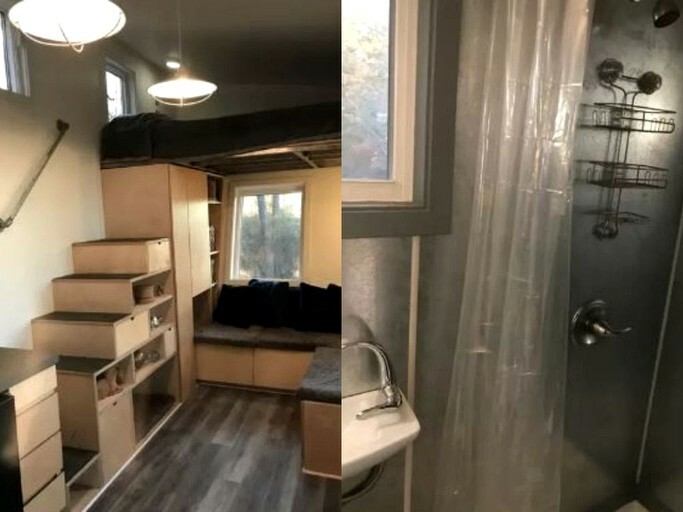 Modern and sleek, this tiny house has an industrial flair with tones of pewter, charcoal, and polished stainless steel. The living area has L-shaped bench seating and a fold-down table with two chairs for dining or work. The kitchen has a microwave, a refrigerator, a stove, a coffeemaker, and cooking utensils. Other amenities include cable television and Wi-Fi. Guests can enjoy relaxation and off-the-grid living at this tiny house, which is located in a secluded spot overlooking vineyards and meadows. 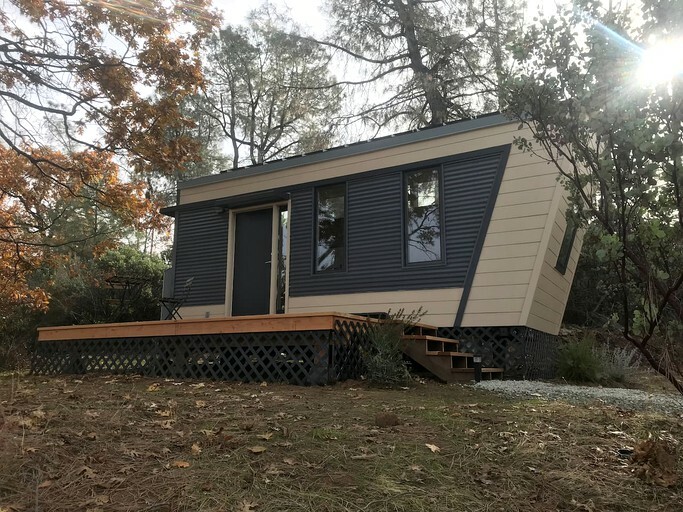 This tiny house runs on solar power, but there is a backup system. The conveniences of Wi-Fi, cable television, air conditioning, heat, and a desk are welcome amenities for those who prefer less reclusive living. The hosts live in the main house, and guests are invited to join them around the firepit or contact them for anything they might need. Two dogs and a cat live on the property. This 13-acre property has walking trails for guests to explore. California's Gold Country features a wide array of nature parks, adventurous activities, and natural attractions combined with a pioneer past and Old West ambiance. Folsom Lake, located within Folsom Lake State Recreation Area, is a popular site for fishing, boating, and swimming. There are a couple of other lakes in the park system, which are also great for boating, windsurfing, jet-skiing, and sailing. Guests can go hiking, fishing, swimming, hunting, and birdwatching at Eldorado National Forest or Stanislaus National Forest. There are bike trails and paved lanes along the Sacramento and American Rivers. Wine enthusiasts will be happy to find out that there are more than 50 wineries in the area, including Miraflores Winery, Karmere Vineyards and Winery, and Saluti Cellars. Other activities include panning for gold, hiking, and fishing at Hemlock Lake, hiking to the waterfall at Bridal Veil Falls, and whitewater rafting, which is a fun and thrilling ride for beginners to experts.